Sara Thompson | TV, eh? To really immerse themselves in a role, actors must make a connection with their character. For Sara Thompson, that ended up being easier than she imagined. 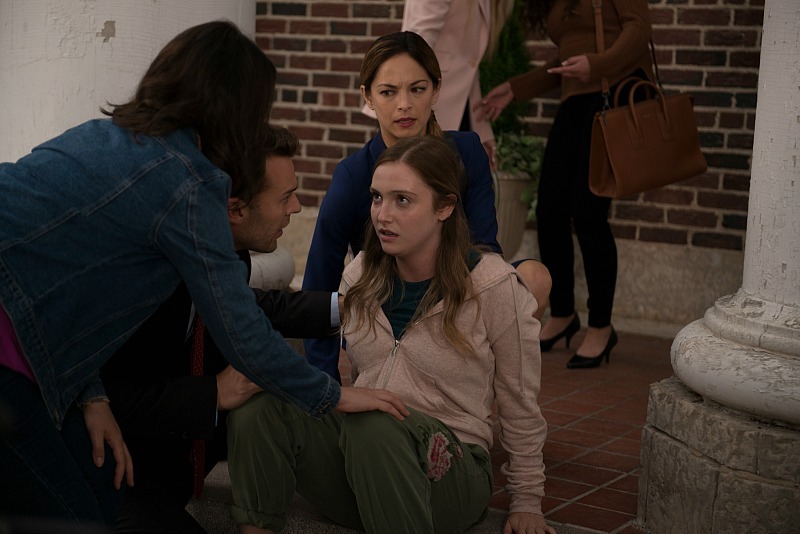 The Winnipeg-born Thompson co-stars in CBC’s Burden of Truth as Molly Ross, a high school student and athlete who has her health threatened. Something in her small town of Millwood is making Molly and other girls suffer from seizures. Is it chemicals in the soil placed there by a local steel mill or something else? Lawyers Joanna Hanley (Kristin Kreuk) and Billy Crawford (Peter Mooney) are determined to find out. Meanwhile, Molly is struggling with the realization her promising athletic career is over, something Thompson related to. “It was so easy to connect with Molly,” Thompson says, on the line from Winnipeg. “Because of her love for sport, it was very similar to my dancing career. I was the same type of person. And at the same age as Molly is I was diagnosed with epilepsy. I suffered from tremors and had to give that part of my life up. It felt like things were crashing down. I had to overcome the same things and it’s crazy how close to home this role is for me and why I fell so hard in love with this character.” In a strange twist, Burden of Truth‘s producers had no clue of Thompson’s history when they cast her. And what she initially thought would be a small role on the legal drama has turned into a major one: Molly has agreed to be the named plaintiff at the top of the case filed against the steel mill. “They wrote the scripts as we went, so we didn’t really know what was going to happen,” Thompson recalls. “I didn’t really know where Molly was going and, initially, I didn’t think my character was as involved and as important as she is now. Reading a new script was like watching a movie.” The actress—whose next projects are on the big screen in I Still See You alongside Bella Thorne and Nomis with Henry Cavill—teases that things are only going to get more dramatic as Season 1 of Burden of Truth continues to roll out. Relationships will be threatened and Molly has to come to an uncomfortable realization about her future. “Molly really wanted to break out into sports medicine and she really wanted to stay in that world,” Thompson says. “I think there was always a lot of pressure on Molly to always be the captain and this is the first time in her adult life that she has to really step back and realize ‘This could kill me.’ And maybe being the leader all the time was too much on her and she was tired of putting her happy face on.” But Molly isn’t going down without a fight. As she was on the soccer field, Molly takes on the role of captain in the courtroom, leading the affected girls in a fight that threatens to tear the town apart. Thompson, like Molly, is a team player away from the set as well. She’s involved in the Orange Daisy Project, a social action campaign supporting the mental health of young women around the world. Burden of Truth airs Wednesdays at 8 p.m. on CBC. Featured image courtesy of Cris Montecillo. Burden of Truth image courtesy of CBC.